For other uses, see Triveni (disambiguation). In Hindu tradition Triveni Sangam is the "confluence" (Sangam in Sanskrit) of three rivers. The point of confluence is a sacred place for Hindus, with a bath here said to flush away all of one's sins and free one from the cycle of rebirth. Pilgrims at the Triveni Sangam, the confluence of the Ganges, Yamuna and a third mythical one, the Saraswati River, in Allahabad (Prayagraj). One such Triveni Sangam, in Allahabad (Prayagraj), has the confluence of three rivers — the Ganges , the Yamuna and a third mythical river the Saraswati. The two rivers maintain their visible identity and can be identified by their different colours. The water of the Ganges is clear, while that of the Yamuna is greenish in colour. A place of religious importance and the site for historic Kumbh Mela held every 12 years, over the years it has also been the site of immersion of ashes of several national leaders, including Mahatma Gandhi in 1948. The auspiciousness of the confluence of two rivers is referred to in the Rigveda, which says,"Those who bathe at the place where the two rivers flow together, rise up to heaven"
The Triveni Sangam in Erode is a confluence of 3 rivers, the Cauvery, Bhavani and Amudha. Of these three, the river Amudha is invisible and is said to flow underground and join the other two rivers from below. It is also called as Kooduthurai, where the famous Sangameswarar Temple is located. Tirumakudalu Narasipura, commonly known as T. Narasipura, is a panchayat town in Mysore district in the Indian state of Karnataka. The first name refers to the land at the confluence, (trimakuta in Sanskrit) at the confluence of the Kaveri, Kabini and Spatika Sarovara (a mythical lake or spring, also named Gupta Gamini). This is the place in South India where local Kumbhamela is held every three years. Kaliyar (Kali river), Thodupuzhayar (Thodupuzha river) and Kothayar (Kothamangalam river) merge and becomes Moovattupuzha river in Kerala and hence this place is called Moovattupuzha. Munnar city is where Mudhirapuzha, Nallathanni and Kundaly rivers merge, the name Munnar literally means "three rivers" in Malayalam and Tamil. Kandakurthi is a village in Renjal mandal of Nizamabad district in the Indian state of Telangana. The river Godavari merges with the rivers Manjira and Haridra. 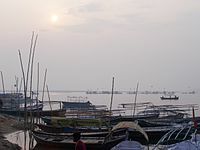 ^ "Triveni Sangam". Retrieved 3 December 2015. ^ At the Three Rivers TIME, 23 February 1948. ^ Kumar, R. Krishna (2013). "The Hindu : States / Karnataka : Preparations on for regional version of Kumbh mela". thehindu.com. Retrieved 15 January 2013. The T. Narsipur Kumbh Mela, being held from February 23 to 25, began around 20 years ago and is held once in three years. This page was last edited on 12 February 2019, at 15:15 (UTC).